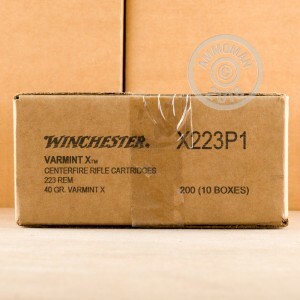 This Winchester Varmint-X ammunition brings down coyotes, rabbits, squirrels, groundhogs, and all manner of other small to midsize pest animals with ease. 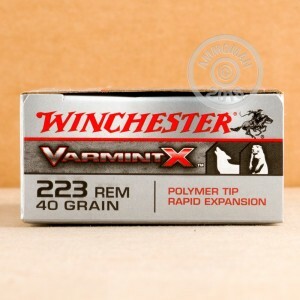 Winchester Varmint-X bullets have a polymer tip for better accuracy and expansion and a thin copper jacket that breaks apart easily. 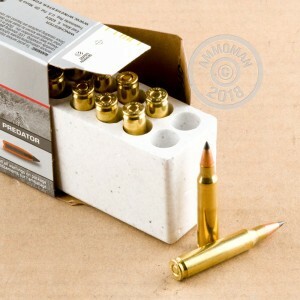 Each .223 Remington cartridge in this box of 20 fires a 40 grain hollow point bullet at 3,700 feet per second. This high velocity helps the bullet fragment quickly for maximum terminal performance. Winchester ammunition is loaded in Oxford, Mississippi and uses non-corrosive Boxer primers and brass cases. Score free shipping from AmmoMan.com with any order over $99!